Whether you base your change-of-seasons attitude on the weather or the calendar, it's time to celebrate Autumn, for it will officially arrive this week. Autumn is the perfect time to make my favorite of all baked goods: pumpkin bread. I bake a lot, and this is one of my most requested recipes. I know there are lots of recipes for Pumpkin Bread, but this one? This one is special. My Aunt Laura gave me this recipe back in the 70s, and I've made it hundreds of times over the years. And over the years I've eaten pumpkin bread made by lots of different home cooks as well as many different bakeries. I'll tell you the truth: this is the best pumpkin bread I've ever tasted. *If you like to bake, do yourself a huge favor and spend a few dollars to order these measuring spoons . The set includes 6 spoons: 1/8 teaspoon, 1/4 teaspoon, 1/2 teaspoon, 1 teaspoon, 1/2 Tablespoon, and 1 Tablespoon. Having all six of these makes measuring so much easier! These wash beautifully in the dishwasher and last for years. Preheat oven to 350 degrees. If you're including nuts, spread them on a baking sheet and roast for about five minutes. This will make them a much tastier addition to your bread. Coarsely chop toasted nuts. Stir all dry ingredients together in mixer bowl. Add all liquid ingredients. Mix well. Stir in chopped nuts if desired. Batter will be very thick, and to be honest it's not very pretty. Never fear. All will be well. Pour batter into prepared loaf pans. I use four inexpensive oblong pans, each about 3 1/2 inches x 7 1/2 inches. This recipe is perfect for four loaves of this size, six "mini" loaves, two or three large loaves, or lots of muffins. You can grease and flour the pans if you like. I just spray mine with nonstick cooking spray. Here's a trick: If you have a kitchen food scale , weigh each pan as you're distributing your batter. Your loaves will play nicely together in the oven if they're all about the same size. Don't stress over this; just make each pan weigh about the same as the others. Depending on the size of your loaves, bake 40-60 minutes at 350 degrees. Bread is done when toothpick inserted in center comes out clean. This is the most important thing: DO NOT OVERBAKE. For these medium-sized loaves, I usually time this bread for 45 minutes and start testing at that point. Even if you have to sacrifice many toothpicks and test your bread every couple of minutes, that's better than overbaking. If it's not done, the toothpick will be goopy. If it's done, the toothpick will be completely clean or perhaps have a couple of crumbs on it, but no goopiness. Remove the bread from the oven just as soon as a toothpick comes out clean. Q: Why is testing the bread so important? A: Because of residual heat, the bread actually continues to bake just a little after you remove it from the oven. So if you leave baked goods in the oven too long, they'll OVERbake after you remove them from the oven. Believe me: it's worth the effort to watch the bread and remove it from the oven as soon as a toothpick inserted in the center comes out clean. Cool in pans for five to ten minutes, then remove from pans and cool completely on a wire rack. See how neatly the loaves come out of the pan when you just spray the pans with nonstick cooking spray? No sticking and no flour residue. I bake a lot, but I never grease and flour pans any more. 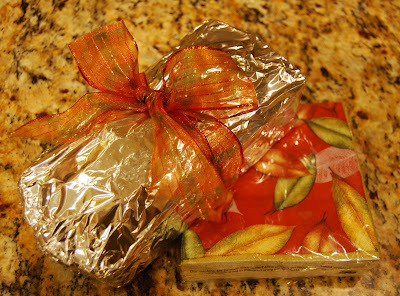 When completely cool, wrap individual loaves in foil. If you don't need all loaves right away, they freeze beautifully. I like to keep a couple of these in the freezer. A loaf makes a great gift for a neighbor, a teacher, a new mom--just about anyone. One of my favorite hostess gifts for autumn is to pair a loaf with a package of pretty beverage napkins. Mix all ingredients together. Add roasted and chopped nuts if you like. Spread on bread or cake (or just eat with a spoon--it's that good!). Store in refrigerator. Or you can make a simple cream cheese glaze which is also really tasty: click here to read about that. Scout's honor: this is one recipe you really should try. I'm joining Beth at Home Stories A to Z for Tips and Tutorials. Mmmm... This sounds wonderful and perfect for this time of year. I always start googling breakfast bread recipes this time of year so your post came at a perfect time! I am not a baker so how do I unfreeze them? Thanks for the recipe! I love pumpkin anything. This sure looks good. Richella...Thanks for the recipes! Yumo! Yum! I think I'll try this! I finally made these today, except I made muffins instead of loaves. Muffins are a staple around here for breakfasts and lunchboxes. Anyway, AMAZING!!! You are right--this is hands-down the best pumpkin bread recipe I've ever made. Thank you for sharing it! YUM. I'm pinning!! And I will let you know when I try it. Three cups of sugar IS a lot, but the recipe makes four medium-sized loaves. So that breaks down to 3/4 cup of sugar per loaf. This recipe delivers such good results that I myself probably would not try to alter it. I estimate that I've made this recipe at least 150 times over the years, and I've never had it fail or served it to anyone who didn't like it. It really is good! This is a wonderful recipe. My two loaves came out perfectly. Love the balance of flavors and it isn’t too sweet. Keeps well in the fridge and then reheat a few slices in the toaster oven. I also made some cream cheese frosting for the side and my kids loved the combo. 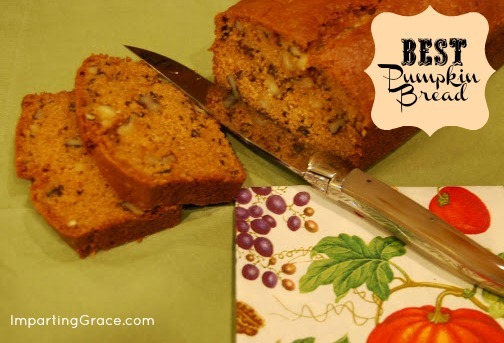 I had to come by to pin your bread recipe for the next time I have a pumpkin craving!